A couple of weeks ago, I received a phone call from a fellow collector. He follows the tool top site regularly, and especially enjoys the occasional detective work that appears. In the course of conversation, he casually tossed a "cookie" my way. "#719 in Bob's last book", you know "Daniel Schaeffers Log Cabin Whiskey" he said. How many are floating around these days and has anyone ever figured out where it's from, or who sold it? I had to plead ignorance. Bob noted having seen the first one in 1986, just prior to publishing the second in the western whiskey series, and stated that it was an amber fifth with an inside thread closure. It looked western, and the bottle was in a western collection. Unfortunately, no label and no IT stopper, and so the mystery remained. I'd seen one example in a large collection in Northern Cal. and one other offered for sale over the years. And that's it. No new ones had been rumored to have surfaced since the 4th edition was published, and no, we'd never figured out anything in regards to provenance. The bottle has remained a black hole since first being reported back in 1987. I've got a surprise for you, he said. I've found another. One difference though, between this one and the other two, a big difference, he said! Remnants of a badly tattered and decomposed label remained on the reverse and the correct embossed matching Riley Patent ebonite stopper was in place. What faint traces of the label listing the dealer, which were legible, matched the stopper! Mystery solved. Western indeed, but not S.F. ; instead, Los Angeles. I'll meet you at the show in Antioch on Friday, he said. The week before the show drug along for me like a kid waiting for Christmas. Around two in the afternoon my pal waltzed in with a smile on his face and a bottle in a sock in his hand. Take a look~ And out came Log Cabin example #3. Sure enough, boldly embossed on the IT stopper (one which I'd never seen before) was "Goldschmidt Bros / Sole Agents / Los Angeles". Who would have thought that this was actually one of the comparatively few brands from So. Cal.? The bottle has a smooth base with no kickup and is void of any base markings. It is extensively air vented at the shoulders and has quite a bit of character. Based on it's appearance, I'd date it to the era when Goldschmidt was located at 635 N Main. And so, another long standing mystery is cleared up. It's been brought to my attention that some of you are having trouble posting comments to the site. Please email me if this is a general problem (as opposed to individual servers) and I'll try to fine tune the setups. Your 3 choices for that whiskey's manufacturer are the Abramson-Heunisch glass co [1898 to 1902], Pacific Coast Glass Works [1902 to 1925] or Illinois Pacific Glass Co [1902 to 1924]. Illinois glass co had a factory in Los Angeles. Hello Bruce, The Daniel Schaeffer's bottle is nice. I do have a base stenciled mini jug with the Daniel Schaeffer and Goldschmidt, with Los Angeles, Cal. *Ed K.
Bruce, Here is some info. on the W. & Co. Kellog's. Dug a couple of the W. & Co. Kellogg's cylinders in a late 1880's hole in Los Angeles in the early 1990's with Tim Blair. One was broken, and the other was whole, until we got it home that evening. The darn thing cracked on the base, due to the temperature change! Just our luck... So I believe it was sold off years ago. I did not have the internal threads for the stopper. Both were darker than the one you have pictured here. 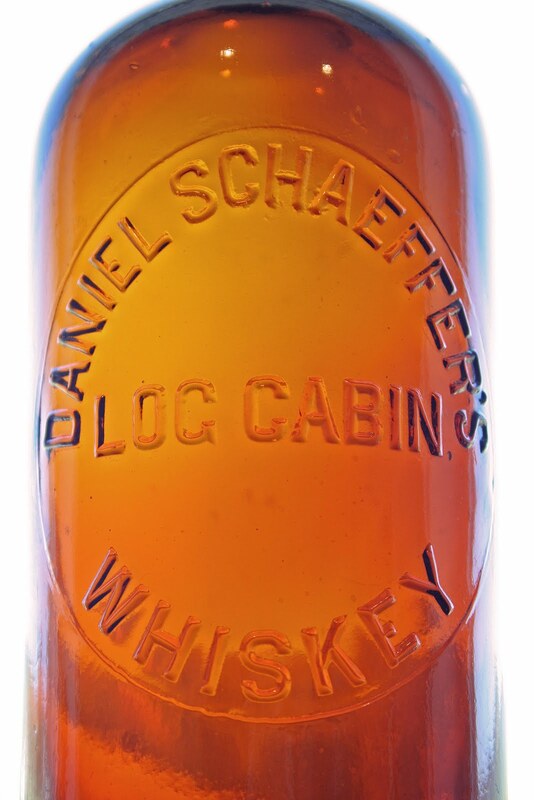 Would not mind owning the Schaeffer Log Cabin bottle! 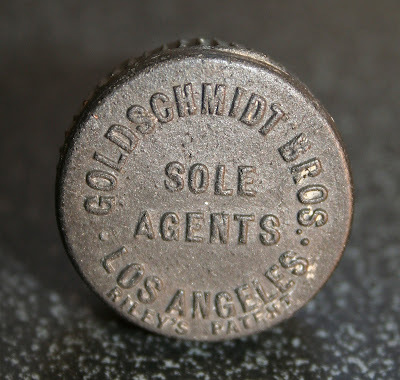 Ed K.
Many thanks for the info on the stenciled mini jug with Daniel Schaeffer and Goldschmidt, Los Angeles, Cal. Please feel free to forward a photo / photos to me via email and I'll be happy to insert them into the article. Sanborn, Sanborn. Wherefore art thou Sanborn. The New Math: Egg + Mole = Oroville?